The MAG-ic Probe custom Software allows you to connect your MAG-ic Probe device to a Windows or MAC computer via USB cable or Bluetooth. The software gives you the ability to record live measurements to an uploaded JPG file which could be a picture or drawing of the instrument or object being measured. Added better enumeration for serial port identifier. WARNING - Please read carefully before purchase. If you are using OSX10.10 Yosemite or 10.11 El Capitan, It seems Apple have changed the way it accepts connections from USB Serial devices. At this stage we do not know if all users will experience the same problems as we and a few users have. We would advise that you use a Powered USB Hub when using the MAG-ic Probe on a MAC with OSX10.10 and above. Any cheap hub should work but if you have doubts please use a Windows Based computer. MAG-ic Probe now has a new Pre-Mapping feature so that you can pre-plan your measuring locations. Simply Enter the Pre-Map Mode and click on the "Map Locations" button. Move the mouse to each location that you will be measuring and click. The system will generate sequential numbers for each location. This can be saved as a file for re-use in future. When you are ready to measure, click on the Map Values button, simply move the probe to location 1 and click anywhere on the screen, your value will be entered into location 1. Move the probe to location 2 and click, etc. For the Ultimate in hands free operation you can try the Auto Insertion mode. Move the probe to location 1 and after the reading becomes stable, the value will be automatically inserted into location 1, Move to location 2 and wait for the value to be inserted. Added a "Settings" Option so you can now choose what to display when you click on the picture. This feature will allow less clutter on the screen and allow you to place more measurements. I will update the manuals soon to reflect these new changes. NEW!! Add Offset - In the settings menu you can now add an OFFSET to the actual reading. This will adjust the actual reading up or down if you feel the gauge is slightly off your other measuring devices. In the settings meny, enter either a positve or negative offset. Thsi is the FREE Lite version of the software for MAC. For full color contoured maps of your instrument, please see the MAG-ic Probe PRO version. This is a detailed walkthrough and tutorial of all the features available with MAG-ic Probe Lite and continuing with MAG-ic Probe PRO software. 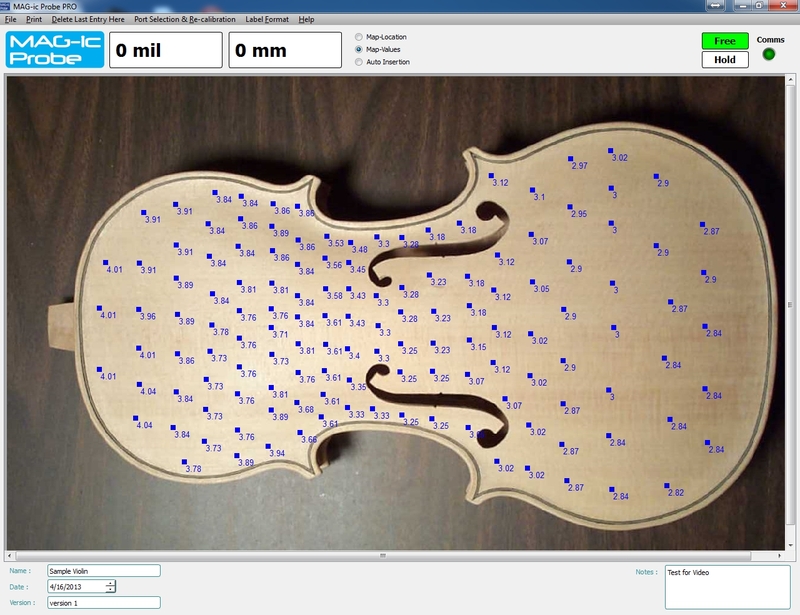 The software allows you to add physical measurements made by the MAG-ic Probe Electronic Thickness Gauge to a JPG picture of the instrument being measured. The PRO version allows you to progress from text values on the picture to a full color contoured image for instant visualization of the thickness contour represented by the measurements. This is a superb product. I checked it for accuracy with a dial indicator and it is exact. I string up mandolins in the white and remove wood until they sound good. Magic Probe allows me to know exactly what I am doing and map each instrument for future reference. The Company provides excellent personal technical assistance and responds immediately. Should have bought it sooner. The magic probe is a must have for anyone pursuing optimum sound through the ability to properly thickness a top after (or before) assembly. Saves time and eliminates guess work to such a degree as to thoroughly justify the cost which was the root of my original hesitation. The costumer service I received getting it up and running with my mac was also outstanding. Highly recommended. Although the product is very good, beacuse it allows to measure with great presicion, there's a small drawback with the setup with the computer, I run a Mac computer, and had a hard time trying to make it work with the usb port. Other than that, it has worked very well. Click the button below to add the MAG-ic Probe Lite for MAC to your wish list.